Spring Wire-wound Tube provides positive transport for hangers. Direct Drive Power unit turns spiral in place, moving items down the line. 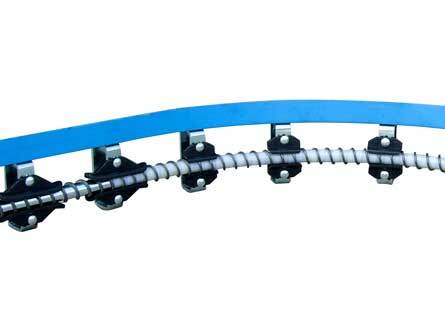 Track mounts on angle suspension frame, easily supported from floor or ceiling. Forward Speed: Up to 15 FPM with overload clutch included. Single Direction system, no return line needed. Left or Right hand spiral twist available to suit application. Up to 90° Horizontal and 20° Vertical turns, for design flexibility. 1/4 or 1/2 H.P. Drive available depending on length and configuration.